Living in a coastal state, flirting with hurricanes and tropical stories every summer and fall, you are most assuredly familiar with a wind mitigation inspection. If you aren’t familiar with them, you may want to become so soon, they can give you a signification saving on your insurance. Many property owners received wind mitigations to assess the preparedness of their homes and businesses in resisting the effects of windstorm damage or loss. These inspections are option and not required by insurances yet but the can save you a ton of money and more than pay for themselves!! Wind mitigation inspections are the only inspection that is almost guaranteed to result in some level of insurance discount on your insurance premium. In 2006, Florida became the first state in the nation to mandate that insurance companies offer some reduction insurance costs if a wind mitigation inspection is sought and certified upon review by a qualified inspector. A multitude of other coastal states have now followed Florida’s lead. So now you’re wondering – Do I just get an inspection and save on insurance? And how much could a person stand to save?? The answer is it all depends on the features of your property. We as inspectors will evaluate the wind-mitigating characteristics of your home or business. Post inspection, we will make recommendations for any improvements or repairs to the property that you could make to enhance its sustainability against wind damage. We will then submit the inspection report to you and your insurance agent. In Florida, an average discount of 30% is typical, save a few hundred to over $1000 on your premium! 1. Roof Covering: inspectors want to know when the roof was installed and does if it meets building codes. In Florida, the code standard was updated in 2001. 2. Roof Deck Attachment: inspectors will determine what type of roof decking is used and how it’s attached to the underlying structure, like if it’s nailed or stapled down. If nails are used, nail length and spacing between each will also be noted. 3. Roof to Wall Attachment: the roof attachments become the focus here: are trusses attached with nails or hurricane clips? Are the wraps single or double? The more secure your roof, the better impact on your wallet! 4. Roof Geometry: is your roof hip or not? Nope, the inspector won’t care how cool it is, just how it’s shaped – a hip roof resembles that of a pyramid, and is a definite qualifier for a discount. 5. Gable End Bracing: if the roof is a gable style, an inspector will review if the gable ends are braced to Florida Building Code standards. Gable ends measuring more than 48 inches tall should be braced for reinforcement, and inspectors will be checking for this qualification for discount. 6. Wall Construction Type: Inspectors will review the construction materials used on your home for framing, reinforcement, and outer fascia, and at what percentages. Steel reinforced concrete block homes may yield a better discount than one with a plywood-only frame and plastic siding. 7. Secondary Water Barrier: This is a newer item for roofs. If your roof was installed or upgraded before 2008, it’s fairly unlikely you’ll have this sort of barrier. As with most newer features, photo documentation, at a minimum, will be required for a discount in this area. 8. Opening Protection: Here, inspectors are looking for shutters and installed-protection devices from wind-born debris for doors and windows. They will also be checking the rating of the devices, if you have them (as in- are they hurricane-rated?). 100% of all openings need to be covered with Hurricane rated protection to qualify for this discount. In the end have a wind mitigation inspection is totally up to you. However the cost-savings per year could more than outweigh the cost. Give us a call today to schedule yours 727-657-1159!! First make sure the water meter is on all the way. Sometimes, when people make repairs they turn the water back on slowly and a little at a time but then forget to go back and turn the water on the rest of the way. If you have recently had a repair done and are now noticing a reduction in the whole home water pressure check the meter or other water shut off areas like the main shut off where the water might have been shut off. Another common cause for home water pressure problems can be the pressure regulator. When the pressure regulator fails it can sometimes cause a large increase in pressure or the opposite a huge decrease in the pressure to your house. This definitely could cause low home water pressure and you would see the change in all the fixtures. Although a pressure regulator can sometimes be matched with a replacement that is the same brand and size in most cases is it better to call a professional and have them take care of it. If you believe the problem is the pressure regulator call around and get some prices to have it changed out. Many times you can get the brand and size right off the side of the regulator so you can get a price over the phone. Old plumbing pipes can be another cause of low home water pressure. This is especially true if the pipes are old galvanized pipes. The inside of the pipes get a buildup that slowly over the years closes off the water ways so water flow to fixtures is reduced until they are virtually unusable. If this is the case, a re-pipe is really the only way to solve the problem. Since a re-pie is a major plumbing repair that requires a permit it is best to call in a professional plumber. Debris — such as sand, dirt, and pollutants — can enter your home’s pipes when a water main fractures. Even without a fractured line, your pipes are susceptible to mineral buildup from the deposits that water leaves behind when traveling through your pipes. Even a small amount of sediment can create a blockage in your home’s plumbing that become one of the causes of low water pressure throughout the home. The solution to this problem is to examine a section of the pipe to determine if a mineral buildup is the problem. If this is the case, plumbing chemicals that break down and flush out the debris can solve the problem more often than not. However, replacing the pipes completely is a perfectly viable solution. You should expect a long and somewhat expensive process, but the positive aspect is that it only has to be done a few times in a lifetime. It’s more or less evident that a leak in your home’s plumbing system will reduce the water pressure throughout the home simply because not all of the water is flowing toward its proper place. To determine if you have a leak, shut off all of the water taps both in and out of your home, and then record the meter. Come back a couple of hours later to see if the meter has changed. If your water usage has increased at all from your first recording, there’s a good chance you have a leak that needs to be repaired by a plumbing professional. Sometimes your problems with low water pressure may have nothing to do with your home’s piping system. It may be caused by a malfunction in your area’s municipal water supply.Just like your own piping, these systems are subject to leaks, buildups and other problems that can affect the water supply and water pressure. Fortunately, you can call your local municipal water supply department to determine if the municipal water systems is the issue and if the problems will be corrected quickly. Have you had knob and tube wiring come back on your 4 point inspection or home inspection?? Confused on what that is and what it means to you?? This article will explain what that wiring is and what it means to you and your home. 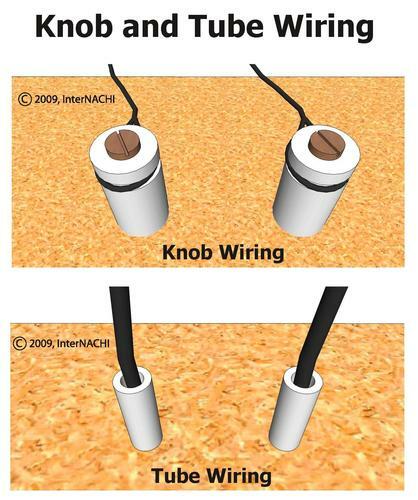 Knob-and-tube (K&T) wiring was an early standardized method of electrical wiring in buildings, in common use in North America from about 1880 to the 1940s. The system is considered obsolete and can be a safety hazard, although some of the fear associated with it is undeserved. 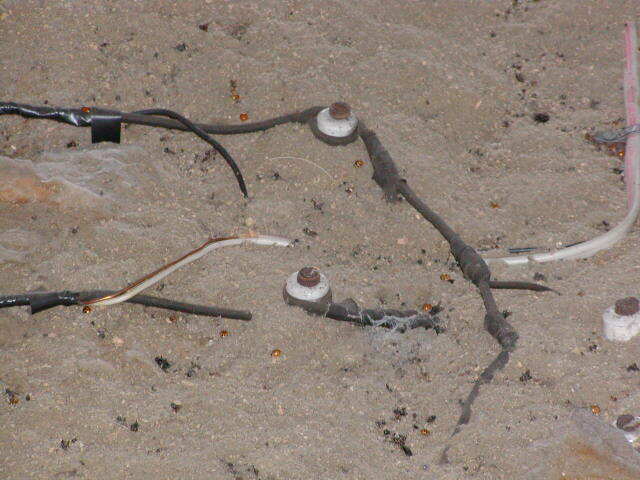 Florida licensed inspectors should always disclaim knob-and-tube wiring during their inspections. •It is not inherently dangerous. The dangers from this system arise from its age, improper modifications, and situations where building insulation envelops the wires. •It has no ground wire and thus cannot service any three-pronged appliances. •While it is considered obsolete, there is no code that requires its complete removal. •It is treated differently in different jurisdictions. In some areas, it must be removed at all accessible locations, while others merely require that it not be installed in new construction. •It is not permitted in any new construction. 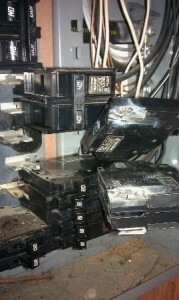 •Unsafe modifications are far more common with K&T wiring than they are with Romex and other modern wiring systems. Part of the reason for this is that K&T is so old that more opportunity has existed for improper modifications. •The insulation that envelopes the wiring is a fire hazard. •It tends to stretch and sag over time. •It lacks a grounding conductor. Grounding conductors reduce the chance of electrical fire and damage to sensitive equipment. •In older systems, wiring is insulated with varnish and fiber materials that are susceptible to deterioration. K&T wiring is designed to dissipate heat into free air, and insulation will disturb this process. Insulation around K&T wires will cause heat to build up, and this creates a fire hazard. The 2008 National Electrical Code (NEC) requires that this wiring system not be covered by insulation. Specifically, it states that this wiring system should not be in hollow spaces of walls, ceilings and attics where such spaces are insulated by loose, rolled or foamed-in-place insulating material that envelops the conductors. When K&T wiring was first introduced, common household electrical appliances were limited to little more than toasters, tea kettles, coffee percolators and clothes irons. The electrical requirements of mid- to late-20th century homes could not have been foreseen during the late 18th century, a time during which electricity, to many, was seen as a passing fad. Existing K&T systems are notorious for modifications made in an attempt to match the increasing amperage loads required by televisions, refrigerators, and a plethora of other electric appliances. Many of these attempts were made by insufficiently trained handymen, rather than experienced electricians, whose work made the wiring system vulnerable to overloading. •Many homeowners adapted to the inadequate amperage of K&T wiring by installing fuses with resistances that were too high for the wiring. The result of this modification is that the fuses would not blow as often and the wiring would suffer heat damage due to excessive amperage loads. •It is not uncommon for inspectors to find connections wrapped with masking tape or Scotch tape instead of electrical tape. Many insurance companies refuse to insure houses that have knob-and-tube wiring due to the risk of fire. Exceptions are sometimes made for houses where an electrical contractor has deemed the system to be safe. This is where many people get confused when they are trying to purchase a new home and have just discovered this from their home inspection. Home Inspection is one of the most misunderstood and misguided activities in the sale or purchase of a home. It’s critical to know what to expect and which Home Inspectors are qualified to do the job right. However, be aware – The Home Inspection report is effectively a snapshot of the house – recording the conditions on a given date and time. Home inspectors cannot predict future behavior, and as such, we cannot be responsible for things that occur after the inspection. If conditions change, we are available to revisit the property and update our report. Why is it critical to have a Home Inspection? Buying a Home is an emotional event. This makes it difficult for home buyers to remain completely objective about the property they desire, which may lead to a poor assessment. Even the most experienced home buyer lacks the knowledge of all components and systems of a building. Real estate is the largest financial investment in your life; you want to make sure it’s a solid one. Home inspections are important and necessary for your own protection and future security. Essentially, they are visual (non-invasive) examinations of the physical structure and numerous systems in a home or building, followed by a comprehensive report. Also important, when a home inspection is performed at the seller’s property, the inspector and the buyer are guests and shall respect the property without moving furnishings or performing acts beyond normal assessment and operation of components which could risk causing damage. Let’s understand that no building is “perfect”. Environmental variables constantly affect building materials from the first day the structural assembly begins. Regular maintenance and repair due to normal wear and tear is to be expected. The primary objective is to reveal conditions that may incur large expenses, immediate repairs or safety related concerns. A thorough home inspector will also document the minor defects that may be useful to the buyer as a ‘punch list’ for upgrades. The Standards of Practice created by the various home inspection associations are somewhat similar and great guides as to what a Home Inspectors shall or shall not be required to perform. However, these are only the “minimum” standards and can be exceeded. You may find these published documents by searching the various association websites. You must be licensed to do home inspections in Florida. Keep in mind, a home inspection is by no means a warranty or insurance policy nor does it refer to construction or building codes. You should think of it as an informative guide and educational experience. The report may also be a useful document when attempting to renegotiate any unknown or undisclosed major findings. 1. Do you conduct business full time or part-time? 2. Are you a franchise or an owner/operator? 3. Who will perform the home inspection? Owner or Employee? 4. What’s your background experience, credentials, years in business and/or membership in related organizations or associations? 5. How long will you spend at the inspection site? 6. Do you walk on roof areas? 7. Is the home inspection report issued on-site or do you provide a full written report within one business day? 8. What additional services do you provide? Will they all be performed by the Home Inspector or sub-contracted out? 9. Do you actually open a back flow test on the sewer to cesspool system? UNFORTUNATELY, most mistakes are made by booking an inspection on impulse with the first Home Inspection service you call, instead of doing careful research. Make it a point to contact 3-4 home inspectors in order to have a good basis for comparison. After diligent questioning, you should have ample information with a respective range of costs. At this point, you may begin to arrange your list of respective qualities and now are close to making an informed choice. The next section will enhance your knowledge in the numerous ways one can be skewed into believing they have found the right individual for professional guidance through their purchase. This is extremely important for you to know – so please take a few more moments to read on and absorb each point made. • ‘Marketing Schemes’ as lures to create a smokescreen for inferior service. These discounters don’t want you to call others and discover they offer a lot more value for a justifiable fee. They will often say something to the effect “we have a special offer today if you book an inspection with us immediately“. Any of the true professional home inspectors that I know in this area do not offer marketing discounts. There is an underlying reason if one needs to do so. • If a home inspector boasts having performed a large number of inspections, take immediate note of it. It is most likely that this Inspector is trying to dazzle you with numbers and hope you won’t think it through. Let’s work this example out and see the outcome: If a home inspector claims to have performed 15,000 home inspections in the past 1 years, that’s 1500 per year or approximately 4 inspections per day for 365 days. Now to accomplish this, the inspector would have spent only 1 hours to inspect each home, have at least a 1/2 hour to 45 minute drive time available to get to each inspection and then back home to write up 4 reports which would need to be completed by morning because of the upcoming 4 inspections the next business day. This Inspector would appear tired and malnourished as there would be no time to eat or sleep, let alone have a family to enjoy a Holiday together. I seriously doubt the latter to be the case. What the boasted or advertised high numbers really mean is that the inspector does quick and inferior inspections, then goes back to the office and completes an inferior inspection report with little substance. Think about quality and not quantity. • A ‘Free Home Warranty’ policy included with your home inspection sounds great, doesn’t it?. With this tactic, a home inspector is basically telling you that they cannot do a good job. These policies are not even ‘Warranties’ (See Magnuson-Moss Warranty Act), which is misleading, if marketed to you that way. Warranties can only be issued by the original Producer/Manufacturer/Service Provider during the initial sale of their product/service. Unfortunately, you are not being informed properly that this so-called ‘Warranty’ is simply a 3rd party ‘Service Agreement’ with exclusions that are almost too numerous to read. The fine print often gives this 3rd party Company the rights to deny the claim based on investigations they perform with their own hired contract service people. Talk about the “Fox in the Hen House”!!! These so-called ‘Warranties’ cost the Home Inspector around $15-20.00 and again, the saying “you get what you are undoubtedly paying for” is most fitting here. But wait one second! You can’t honestly believe that you are getting this for free, did you? There is an actual website message board forum where Warranty Company President, who also happens to be an Officer/Director of a self-proclaimed largest Home Inspection Association, instructing home inspector members as to how a prospective home buyer should be marketed with his Company’s Home Warranty to ‘clinch the deal’ so to speak. He even tells them how they should increase their home inspection fee by $20.00 so you the buyer are paying for it, while making it appear to you that the inspection company is picking up the tab. Ever hear that saying, “If it sounds too good to be true, it probably is”. • The touting of meaningless ‘Certification’ is craftily being used by an overwhelming majority of home inspectors lately in mere attempt to create false perceptions. Some Associations even include the word ‘certified’ in their name as a marketing lure. They provide an un-proctored entrance exam, which is more of a quiz, through the internet. Most anyone can pass it and become a member without ever performing a single home inspection. This hurts an unsuspecting home buyer, while the so-called ‘Certified’ Association boasts thousands of members all the way to bank. My certifications and licensing are validated by New York State or Accredited Training programs with rigorous requirements and proctored testing. • Ridiculous titles such as ‘Master Inspector’ have only recently surfaced. In all the years I’ve been inspecting real estate, I can professionally state that this occupation is not a skill which an individual can perfect. This illusionary title was conjured up by a profiteer through the internet. Each and every property is unique, requiring a custom approach by a licensed, knowledgeable and perceptive individual. Let us be thankful that we don’t see signs such as ‘Certified Master Doctor’! • The useless pitch “I use the technology of an infrared camera during my inspections”. Most veteran home inspectors can make educated assessments of areas with their invaluable human senses. Infrared camera technology in the field, labeled as ‘Thermography’, is highly sophisticated and has a special parameters for application. Home inspections for real estate transactions are not the time to do these. The right conditions must exist for one of these cameras to ‘see’ a latent deficiency. These conditions are not guaranteed during your inspection, hence, numerous exclusions are sure be stated somewhere in the fine print of that inspector’s report. Here we go again with quickie ‘Certifications’ that are easily attainable for the sake of equipment companies wanting to sell an expensive piece of equipment. Also, the inferior models of camera, which most all home inspectors own due to cost, are too often in the wrong hands of inexperience. This marketed tool will distract your home inspector from doing their job to engage the amazing natural senses of sight, touch and sound along with focus on cause and effect relationships in building science. • ‘Mold Testing’ – If you are being offered or scared into this service you should hang up and call the next number on your list. Veteran home inspectors call this the ‘MOLD IS GOLD’ syndrome which is too often used by cheaper priced services to pad their fee higher or by inexperienced inspectors who are sold on a one day ‘Certification’ course to know everything there is about mold. Think about this seriously – why are you being sold on mold testing if the home inspector has not even been to the property to assess if there is a reason to do so. Your health is not their main concern, but merely a matter of substantial profit generated from testing. If one does not have a minimum 4-year college degree in the Science of Microbiology, they should not be testing for mold (fungus). Even when testing for any known species is performed, it does not provide a definitive action that is outlined in any current day protocol. You’ll simply have a document which shows many numerical values and categories. A sincere veteran home inspector will keenly detect concerns for extraordinary mold (fungus) conditions and may recommend further evaluation or treatment by a qualified professional if necessary. • The septic system ‘Dye Test’ is one of the oldest and most inconclusive evaluations you could waste your money on. If you are being offered this service, which will be 95% of all home inspection services, you may as well fill out a check for the typical $50.00 and wait until a strong wind comes along to hold it up high and let go. ‘Dye testers only offer the statement “there were no unusual areas of moisture observed in the yard”. Of course, because most problems exist beneath the surface and do not show up with what I call “The Blind Dye Test“. Keep in mind, septic systems are an expensive part of the home and should be properly evaluated by a qualified professional. A Home is not a “Home Sweet Home” if the Septic System is not functioning properly. • Free homeowner handbooks or repair guides included with your inspection. These are an absolute waste of our environmental resources. These books are useless in the way of providing generalized explanations about home repairs and maintenance. With the internet at your fingertips, you can find detailed information about anything involving your home from true experts while saving paper on useless handbooks. I can bet you that all of these books will sit on a shelf until the next millennium or when needed as a starter log in a fireplace. Lastly, the failure rate among home inspectors in their first year of business is guessed to be about 70%. Of those remaining, 30% will probably not make their third year. If you retain the services from one of these individuals, you may not have any recourse should issues arise after their inspection. In addition, you will not have available support for future questions during your home ownership. Six years after the scourge of defective Chinese drywall in Florida homes first surfaced in the public eye, some homebuyers continue to unknowingly purchase homes that have not been fixed and paying the price. Florida has the highest number of drywall homes among 44 states reporting the problem, along with the District of Columbia, American Samoa and Puerto Rico. Estimates range from about 12,000 to 20,000 homes affected. Lee County is the focal point of the problem in Florida. About 2,000 homeowners in Lee have asked for property tax relief because their homes have been tainted by the drywall since September 2009, when Ken Wilkinson, county property appraiser, began to offer it. In comparison, Collier County had only about 140-150 homes reported as having defective drywall, according to its property appraiser’s office. The drywall, imported mostly between 2004-08, smells foul and emits sulfur compounds that corrode air conditioning coils, electrical wiring, metal appliances, electronics, jewelry and plumbing fixtures. Residents with the drywall complain of health issues from nosebleeds to respiratory problems. “My advice to a home buyer is to always ask if the home had drywall problems if built after August ’04, which the seller or their agent is required to disclose,” Wilkinson said. There are guidelines for remediating homes set by the Consumer Product Safety Commission, and more stringent guidelines from federal Judge Eldon Fallon, who presided over thousands of drywall cases in multidistrict litigation in New Orleans. Neither protocol is mandatory. As a result, some contractors just fix a home until they believe it is repaired well enough, removing drywall, repainting, but not replacing fixtures or wires that are corroded by sulfur compounds the drywall emits. Jason Nicko, president of Abisso Remodeling, said most of his business is remediating Chinese drywall. He moved to Southwest Florida more than two years ago and said he encountered homes that “undoubtedly” had drywall when he was looking to buy. “I know what it smells like. I can tell walking in the front door,” he said. The sellers said the homes had been inspected and were clear of the drywall, but wouldn’t allow him to test, Nicko said. Even if the home is sold “as is,” a seller by law has obligation to disclose anything that affects value of the property. There is no law a seller has to do an inspection. If something wrong surfaces, the buyer has to prove the seller knew about it. The average cost of fixing a home with drywall is about $100,000. Homes basically have to be taken down to the studs and rebuilt. Arthur and Liz Grover of Pennsylvania want to retire to Florida and were looking for homes in Cape Coral. “Several of the homes were suspect,” he said. The couple was aware of this because friends Richard and Patti Kampf of Cape Coral accompanied them on their search. The Kampfs’ home had Chinese drywall and was remediated. They eventually led a grassroots group of drywall homeowners who advocated for government help. The Lee County list stands at 1,966 who have requested tax relief due to drywall, said Tom Pokorny, county IT and data service administrator. A total of 1,028 homes have been remediated, or 52 percent. An additional 277 properties did not respond to the annual county query asking whether they continue to have defective drywall, so they have been taken off the list, Pokorny said. Another 18-20 properties are exempt from being listed because they belong to people in law enforcement or the judiciary. Cape Coral residences made up about 32 percent of the total list. Homeowners who meet criteria will have their home value dropped to $10. But they have to pay taxes on the value of the land the home sits on. The tax break is not automatic. You have to be able to prove it by meeting county criteria. The verification process and documents needed are outlined on the drywall page of the property appraiser’s website. Condo owners also have reported defective drywall. They get less of a tax break because condos have no land value; the land is owned commonly. The county bases the tax break for condo owners on difference between sale price of a condo without defective drywall, and one with defective drywall. The current tax break is 23 percent, Pokorny said. Homeowners need to have an inspection for the drywall to protect themselves, said Allison Grant, an attorney who has represented about 1,000 drywall clients across the state, including about 300 in Southwest Florida. Prospective buyers also can search public records to see if the owner filed a lawsuit because of drywall, or see if tax relief was given. Some investors are looking to flip homes, and banks are ridding themselves of foreclosure inventory, she said. “I think one of the biggest problems is the banks.” If the homes aren’t inspected, sellers can say they didn’t know, she said. Gloria Tate, a real estate agent with Raso Realty in Cape Coral, said she’s sold a couple of homes that were remediated for defective drywall and recertified by the city. The fact was disclosed to the buyers, with no subsequent complaints, she said. But some homes on the market with drywall are not listed as either having drywall or suspected as having drywall in general disclosure comments in the Multiple Listing Service, she said. The fact may instead be listed in a confidential disclosure only real estate agents can see. “It’s supposed to be up there,” Tate said of the general disclosure. The only reason she believes some may hide it is that homes with drywall sell for a much lover price, so people are more apt to inquire about them, she said. The agent can then tell the prospective buyer the home may have drywall, and offer an alternative listing. Tate said her sister just lost her home with drywall to the bank after living in it for eight years. “I know several people living in them still, taking their shots that it won’t kill them,” she said. Homeowners can do tests on their own to indicate presence of Chinese drywall. • Take a piece of copper wire and hang it on the return of the air conditioner, where the air that circulates through your house is drawn back into the unit. Wait about two weeks. If the wire turns black, that indicates possibility of defective drywall. • Place a piece of copper tubing in a mason jar along with a piece of drywall from an area in your home where you suspect the presence of defective drywall. Close the lid and place it in an area where it is exposed to heat and humidity, such as a garage or lanai. Wait about two weeks and see if the copper turns black. If you are considering purchasing a new home, or even just want your current home checked out, please give us a call! We can help, 727-657-1159! Looking for a Home Inspector in Bay Area? Here are 5 must ask questions before you decide. The home inspection process is a key step to buying a home since often offers are contingent on its findings, so working with the right inspector is important. After all, you don’t want to buy a home only to find out the inspector missed the cracks in the foundation or an on-the-fritz furnace. Question No. 1 What are your qualifications and experience? Qualifications for the home inspector vary greatly by state. According to Jacques, some states only require professionals to pass an online test while others require obtaining a license and meet ongoing education requirements to stay licensed. According to the U.S. Department of Housing and Urban Development (HUD), the inspector should be able to provide experience as well as references and referrals. Question No. 2 What type of report do you provide? The most valuable part of the home inspection is the detailed report that lists any issues, problems or potential troubles with the house. How the report is crafted and how long it takes to be submitted to the buyer varies. HUD recommends asking for sample reports and making sure a candidate can produce a report in a time that meets your needs. Inspectors typically provide their full report within 24/48 hours of the inspection. Question No. 3 What does the inspection entail? Before you hire an inspector, make sure the evaluation will cover all your necessary requirements. According to real estate experts, the inspector should be able to tell you ahead of time what areas will be inspected and also provide a written copy of what the inspection will cover. If there are specific areas you are concerned with, make that clear before agreeing to work with an inspector. Question No. 4 How much do you charge for the inspection? On average, a home inspection will cost between $400 and $500 but that price will range depending on the size of the home and where it’s located. While it’s tempting to go with the lowest cost provider, Jacques says that’s not always a good idea. “A lot of times the guys that don’t charge a lot are the ones that don’t have a lot of experience and don’t know what to charge,” says Jacques. You end up getting what you pay for, he says. Question No. 5 Can I attend the inspection? Following the home inspector during the review can be a learning process to understand the house better and identify the potential problems. Give us a call for any questions you may have! Need a home inspection? Make sure and hire a licensed home inspector! Problems are everywhere…. Challenger electrical panels are on fire! Really — check your panel today since it was popular in the ’80s and ’90s. They’ve since been discontinued. Challenger was a popular manufacturer of electrical panels and other electrical products during the ’80s and ’90s. Thousands of homes were equipped with Challenger electrical panels, but the brand was later discontinued once people realized that the panels were melting under normal conditions. A melted electrical panel can be incredibly dangerous, so many homeowners whose homes were manufactured more than two decades ago find themselves in need of replacement panels. This article will cover the basics of these Challenger panels, including the pros, cons and costs. The most obvious benefit of the Challenger panels was that they were easy to install. Challenger panels were nearly ubiquitous. It was not uncommon for homes to have a Challenger breaker switch, circuit fuse and other electrical and wiring products. When it comes to electrical wiring, safety is absolutely important, and these products performed well under most circumstances. However, as many homeowners would later find out, the products were deeply flawed during the manufacturing process and not considered up to the general safety standards for home electrical products. Challenger products did not always feature the brand name. Many of them were labeled as GTE-Sylvania. Homeowners should first try to locate products in their breaker panels with this brand name. It is quite likely that any such products will need to be replaced right away. It is recommended that you do not try to do this by yourself, as wiring electrical problems can be dangerous. It takes professional expertise to install wiring properly and safely, so locating a licensed contractor for an estimate on replacing the faulty product is usually the best idea. Electrical how to guides are generally not sufficient to perform this type of work. Challenger products often came with a warranty and the company did a fairly good job at honoring their product guarantees. Wiring a circuit is a difficult process, and it turns out that the circuit breakers used in the Challenger electrical panels were faulty, causing the circuits to short out and overheat under normal circumstances. Challenger electrical panels were known for their relatively low price point. Compared to other manufacturers of the day, it was a great brand in terms of affordability and quality. Unfortunately, the bad wiring of the circuit breakers wound up costing many homeowners far more than they saved with their initial purchase. These faulty breakers wound up being sold to many other brands besides Challenger and GTE-Sylvania and caused many recalls to take place around the country. It is estimated that hundreds of thousands of homes used these faulty products and many of those were affected by the overheating malfunction. Now that you know the basics of Challenger electrical panels, including the failure of the brand, safety concerns and general pricing, you can make an informed decision on whether or not to replace this product in your home. When you’re ready for a new electrical panel, hire qualified electrical contractors. 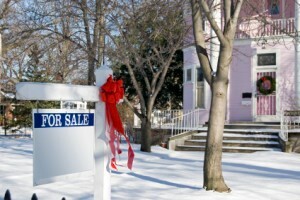 What you need to know about buying a home during the holiday season. While you may assume it’s not an ideal time to be looking, there are some advantages to buying this time of year. If you’re house hunting over the holidays, you’re likely a serious buyer with an immediate need. Perhaps you have to relocate for a new job opportunity, or there’s been a change in your personal life? Regardless, while you may assume it’s not an ideal time to be looking — namely because there isn’t much to look at — there are some advantages to buying this time of year. Let’s start with the obvious one: less competition. This lowers the chances of multiple offers and bidding wars (something we saw a lot of last spring/summer), and should translate into a bigger discount for you. Know your market! This is where sites like Zillow come in handy. Start your research for comps in your area and to see what homes are selling for. Why would sellers pick such an inconvenient time — while everyone is busy entertaining family and friends and enjoying the spirit of the holidays — to list their properties? Probably because they need to sell and may feel compelled to do so before the end of the year for tax purposes. What this means for you: less hassle when it comes to negotiating; a greater willingness, on the part of the seller, to agree to concessions; less chance of the seller waffling; and greater respect for your offer, even if it’s a little lower than the seller was perhaps expecting. Lenders aren’t as busy this time of year, and less volume could mean faster approval. Some lenders might even be willing to reduce fees during the off-peak season in hopes of gaining your business. Regardless, don’t just go with the first lender who comes along. It pays to shop around. Get multiple quotes and check out lender reviews. Found that perfect house but it’s for Sale by Owner??? Here is a great article that I found to help you understand what you may be getting into with those situations. Enjoy! When deciding how to go about the process of selling their homes, homeowners should carefully consider the pros and cons of hiring a real estate agent. While most sellers opt to hire an agent to assist them with the sale, a minority of them choose to sell it themselves. In 2006, these “for sale by owner” (or FSBO) sellers totaled 12% in 2006, according to the national Association of Realtors. FSBO sellers stand to save an enormous amount of money, but to do this well, they must be knowledgeable and shrewd in a territory which they may find unfamiliar. In the U.S., real estate agents typically take 4 – 6% of the price of the home, which many homeowners view as unjustifiably large, considering the agent puts none of their own money into the home and comparatively little of their time. Yet, sellers must consider that this fee is usually split between the the buyer’s agent and seller’s agent, and the brokerage must be paid too. After taxes, the average real estate agent makes a humble living. Although, understandably, the seller doesn’t care about how the commission is split up, as they’d much prefer to pocket the whole amount. Perhaps the best reason to hire a real estate agent is that they know how to price a home, and, without their assistance, the seller may waste months trying unsuccessfully to sell an overpriced home, or, worse, sell the house for too little. When selling a home without an agent, owners will be responsible not only for paying the fees charged by various professionals, but they will also be responsible for finding these professionals in the first place. A competent real estate agent will know to not skimp on the home inspection, for instance, by exclusively hiring licensed home inspectors. • Don’t skimp on house preparation. Your house will be in competition with houses listed by agents who coach their clients on how to prepare their house for showings. • Learn about legal requirements for disclosures in your area. If you do not disclose certain information to the buyer, they might be able attack you later in court. • Familiarize yourself with the paperwork and contracts required by a real estate transaction. It often pays to hire a lawyer to review the contract. • Research advertising and marketing tools available to you on the Internet. There are some sites that will even help you develop a video tour of your home. • Hone your negotiating skills and be prepared to turn down some offers. Real estate agents are expert negotiators, and the buyer’s agent might try to take advantage of your inexperience. • Hire an licensed home inspector to perform a Move In Certified inspection. This is an oldie but a goodie, had a friend recently sell their home and it opened up a can of worms. I decided to post this blog again for all you sellers out there! If you are selling a home, you’ll get the highest price in the shortest time, if your home is in top condition. And you want to find out about any hidden problems before your house goes on the market. Almost all sales contracts include the condition that the contract is contingent upon completion of a satisfactory inspection. This is known as the inspection contingency. Buyers will insist on a professional home inspection performed by an inspector they will hire. If the buyers’ inspector finds a problem, it can cause the buyer to get cold feet and the deal can often fall through. At best, surprise problems uncovered by the buyers’ inspector will cause delays in closing, and usually you will have to pay for repairs at the last minute, or take a lower price on your home. It’s better to pay for your own inspection before putting your home on the market. Having a pre-listing inspection done will make the whole sale process easier. Find out about any hidden problems and get them corrected in advance, on your own terms. Or present the items as is and reflected in the purchase price. Otherwise, you can count on the buyers’ inspector finding them, at the worst possible time, causing delays, and costing you more money. One of the key benefits of having the inspection done early, is that if there are any problems discovered that need to be repaired, you can have the repairs done on your own terms, on your own schedule. When a problem isn’t found until the buyer has an inspection performed, the deal you’ve worked so hard to get done may fall apart unless you act quickly to get the repairs done. Or you may have to take a lower price, in order to keep the deal moving. In either case, you’ll almost certainly have more headache, and spend more money, than if you’d known about the problem and had it repaired before negotiations began. You could save thousands by simply being able to shop around and get competitive bids from contractors, rather than being forced into paying for a rush job at the last minute. Another area where you can save money is in having flexibility to choose the materials used in repairs. Sales contracts usually specify repairs must be made using materials of comparable quality. By identifying needed repairs early, you’ll have the option to save money by using less expensive materials for the repairs. You can also benefit from simply offering certain items as is. Often, you can negotiate with a buyer to accept items in the current condition by stipulating that they are reflected in the purchase price. But that same buyer may walk away from the deal if the conditions come as a surprise, after an offer has already been made. If the home is inspected before the house goes on the market you will be aware of the condition of the house before an offer is made. There won’t be any surprises and the deal is far less likely to fall apart. It takes a lot of effort to get a sales agreement signed in the first place. If the inspection turns up problems, the buyer will want to negotiate a new deal and that second sales agreement is usually even harder to get done than the first one. Seller’s home inspections don’t cost, they pay! Call Asper Inspections today to schedule your listing inspection!